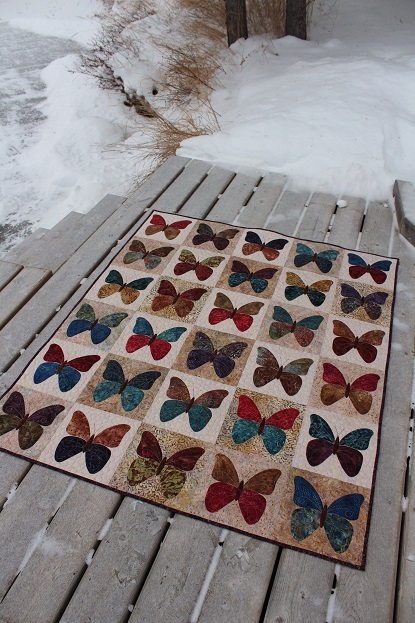 Tamarack Shack: Butterflies Quilt Done! Back in October I shared a post here on my Butterflies quilt and this week I was able to quilt it up and even get the binding on! The pattern is by Laundry Basket Quilts and I used batik fabrics from my stash. I think a lot of them were from the Paint Box Batiks and Over the Rainbow batiks collections. 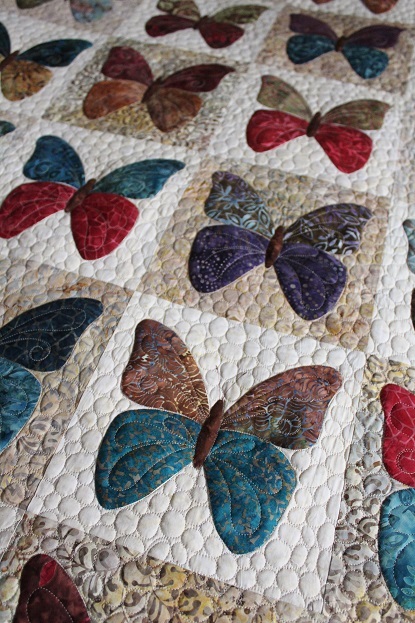 Once I had the blocks done I debated about appliqueing the butterflies down or just quilting them down. I know I would be happier if I did machine appliqued so took that extra time to do just that and I’m very happy I did. I used a smoky invisible thread and a blind hem stitch. I also started to hand embroider the antenna on but stopped, picked that out and borrowed a brown permanent marker from a friend to draw them on. Very happy I did that too. Seems I’m starting to learn to listen to my gut about where to take short cuts and when to spend the extra time on my quilting projects. 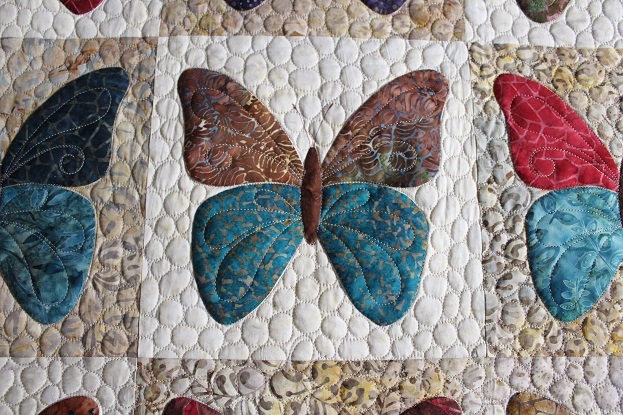 For the quilting I SID around the butterflies and their body and added the feather details to the wings at the same time, only one start stop on each butterfly. 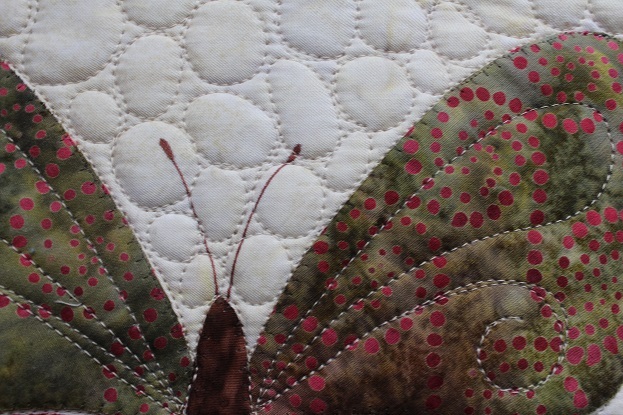 I wasn’t sure at first how to quilt the background…should I just use a meander, loops, swirls….or pebbles! 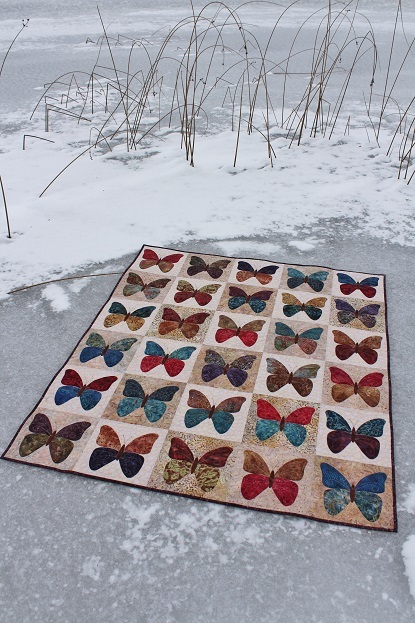 I have been pebbling a lot of quilts lately and that can take a toll on my back ( which I’m paying for today) but this was a small quilt and I knew it would really make those butterflies pop off the background if I did. So I listened to the inner voice again even though I didn’t want too at first. I used Quilters Dream Blend batting and a light beige So Fine thread. You can really see how the pebbling make the butterflies stand out in the next picture. Here is a close up picture of my machine applique to show you the stitch I used. I prefer the blind hem stitch as it works great on curves. I used to use as zig zap stitch but it can look messy on tight curves. I haven’t made that many quilts for myself this year, my ‘Year in Review” will be quiet short so I’m hoping to finish up a few more in the next week or two. Wow, and they are all totally stunning, and on the snow.I use stitch #23 on my Bernina, they go in on a slant, and equally good on corners.Love those batiks. This is a gorgeous quilt. The quilting really sets it off. You made great decisions about where to spend the extra time - secure the applique, and where to take an easier way to accomplish the same task - the antennae. It turned out so great with the quilting! Gorgeous work! Love those pebbles. You have great patience and they really do make your butterflies pop. Another gorgeous creation. 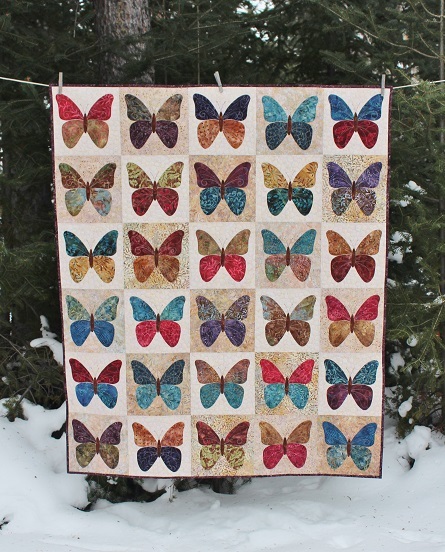 I love your batik butterflies and the quilting really makes them pop!- lovely! I love that pattern! I love how the Laundry Designs often combine batiks with romantic flowery prints too. You have done fabulous quilting. I like the look of pebbling too, but as you say it does take a toll on the body! I just did a GMG quilt for a customer and I pebbled the background with the odd swirl, afterwards I always feel I need to put my feet up with a good coffee :-) rest well you have earned it! Edyta is one of my favourites. 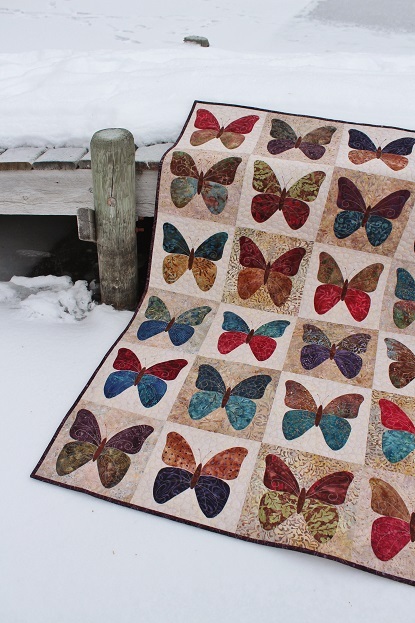 Her colour combinations are really beyond compare and your quilting is perfect. I love what you did in the butterflies. Merry Christmas, Kathy. I just made the mini version of this quilt. It was a kit I got at the Flash sale on Fat Quarter shop and I love it. Now I just might need to make a larger version! 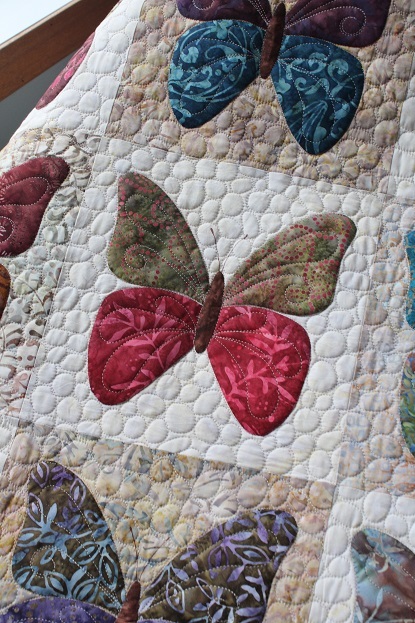 I love this butterfly quilt. Such a beautiful job quilting it! It ranks right up there with the Batik Beach Quilt from awhile back. Both are wonderful! Ооооо, яку чудові, прегарні метелики!!! Another amazing quilt, Kathy! Just stunning. Es realmente precioso. Enhorabuena por tan bonito quilt y acolchado. This is one of my favorite quilts ever! Beautiful work! Thanks for the heads up! I clicked the link but it's a closed group so couldn't see it or comment. This has happened quite often with my photos the 'bait and click' quilting sights. Very frustrating! I bought this pattern to make in memory of my daughter, who passed away, but have not attempted it yet as I am a novice quilter. Your extraordinary work is such an inspiration! Thank you so much for sharing! I have not mastered my own machine quilting yet. How did you do the antenna? I just finished a block and tried to satin stitch them but it doesn't look very good. Oh I see your answer...you used a brown permanent marker. do you think that would wash out?